Helmets are mandatory! Helmets should be ANSI, SNELL or CPSC approved, and must be brought to the registration desk at check-in. Safety First! Cycling safety and strict adherence to all cycling rules of the road are imperative. Riding two, three and four abreast is a violation of traffic laws and safe riding practices. Not only does this put you at risk but also events like this. Be safe – be considerate. Learn more about safety here. This event is rain or shine. There are no refunds for this event. All registrations are final. Do I need to register before arrival? YES! There is limited or no availability for new registrations at Sherwood Island. Automobile: I-95 to Sherwood Island Exit 18. Turn LEFT off exit if coming southbound/turn RIGHT off exit if coming northbound onto Sherwood Island Connector. Drive .9 mile into the park. Follow parking signs. Metro-North: Take train to Green's Farms station. Exit the platform and ride over to New Creek Rd. Turn RIGHT and pass under I-95. At the T intersection, turn LEFT onto Green's Farms Rd. Cycle 1.1 miles to the traffic light. Turn LEFT onto Sherwood Island Connector for 1.2 miles into the park. Follow parking signs. Are bicycles allowed on Metro-North trains? Yes, but limited in number. Please see the Metro-North website for more information. We strongly encourage all participants to be at least 16. A waiver is needed for anyone under 16. When can I arrive at Sherwood Island? When is check-in? Arrive anytime after 6:00 am. Breakfast available after 6:30 am. Check-in begins at 7:00 am and closes 10:00 am. NO! Riders go at their own pace; there is no timing or monitoring of time. What are suggested start times for my ride? • Meet time: 9:00 am: 25 km (15 miles) to be led by experienced ride leaders at approximately 9:30 am. When will lunch be available at the Food Trucks? How do I get a Bloomin' Metric® jersey? Simply go to the menu and drop down to Order Cyclewear. Click on the Purchase Now button. What if I ordered the wrong size jersey or clothing? Please exchange at Sherwood Island at the Bloomin' Metric® clothing store. Depending on availability, either can get an immediate exchange or we will mail it to you. 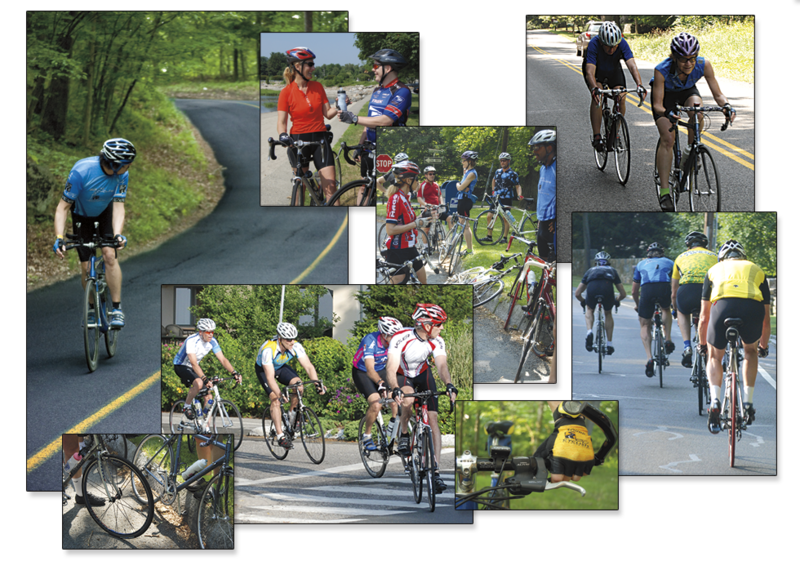 We are a volunteer-run recreational road cycling club located in Fairfield County. Our club annually provides 1300+ organized rides and events, taking place throughout the week and weekend, serving cyclists of all levels. We stress safety, fun and fitness, and host a variety of social activities. We also offer cycling seminars, emphasizing safety and skill improvement, and partner with many local bike stores for other in-depth programs and a discount program for club members. Our Public Ride Schedule shows abbreviated ride, clinic and event listings one week out, with a contact person included. The Club Member version shows full listings several months out with route map and additional ride or event information. Members also can sign up for our chat room, which is used for club messages about rides, events and weather cancellations, and can join our very active Facebook page. Almost all our rides, cycling seminars and events are free. Some special events have fees to cover meals and other expenses. MEMBERSHIP is $25 per year. Interested in recreational road cycling but not sure how to start? • In April and May, there are free educational sessions on Getting Started in Road Cycling that might be of interest. • There will be a special ride led by experienced ride leaders at the Bloomin' Metric® for new or less experienced riders. See details below. 1½-hour session for less experienced cyclists or those new to road cycling, this is a mixture of presentation/discussion/demonstration and provides a basic orientation into getting started and safe riding. Free! No registration required – just show up! Location: Westport-Weston YMCA. Date and times will be posted on the club calendar. Announcements may also arrive via E-mail. The 25 km (15 mile) ride was specifically created to be led by experienced ride leaders to guide new and less experienced riders through a fairly easy course. We are asking riders to plan on arriving early enough at Sherwood Island to give yourselves time to park, gather up your bike, helmet, water bottle and other things you might need and getting to and through the registration area. Also, you can take advantage of the breakfast we provide all riders. The plan is that around 9:00 am announcements will be made for these riders to gather in a designated area. This is usually outside the circle of picnic benches surrounding the flagpole before you get to the pavilion. You'll see this area as you head from the parking area to the registration area. Once we are all together there will be a brief orientation on Safety and Group Riding. Be sure your bicycle is in good working order before you arrive at the park. We recommend that you find out the tube size for your tires and purchase and bring the extra tube with you. Not sure? Get a free inspection at 36 local bike shops. We strongly recommend all cyclists to be 16 or older at the Bloomin' Metric®, sorry no bicycle child/pet trailers are permitted.